scandinavian inspired style–for the kids! 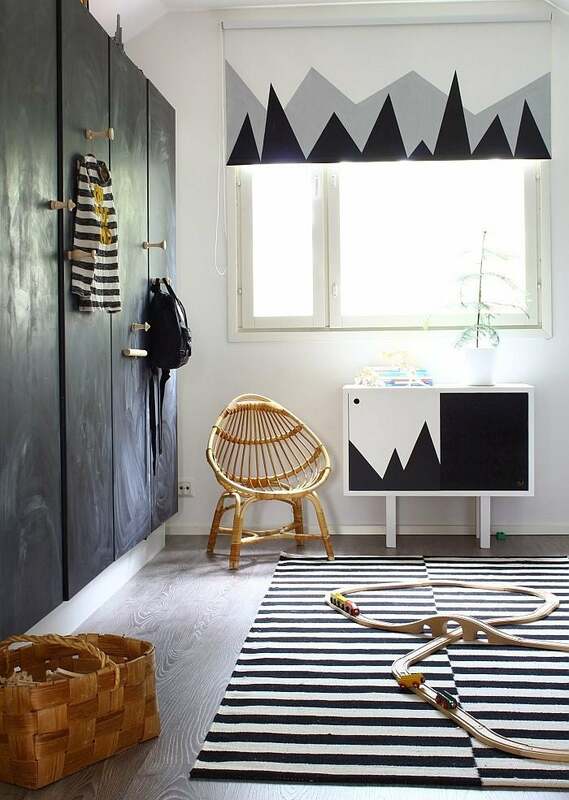 the minimalism and design you love needn't skip the kids' rooms! Streamlined, cozy and functional are all words that come to mind when you describe Scandinavian décor. Whether it’s neutral and organic or bright and colorful, this distinct style is not limited to grown‐ups. Here, we explore eight ways this trend is easily at home in children’s décor. Creams, pale blues, and light browns are all indicative of a Scandinavian color palette. Keeping interiors muted helps when the weather outside is drab in Scandinavian countries. Use this to your advantage in a kid’s room by creating a cozy getaway no matter what the weather! Teach them their shapes using circles, triangles, squares or even clouds! This fun and easy addition to any children’s room can be achieved using wall decals or geometric rugs. Pick a single shape and run with it or mix and match for a fun outcome. Combining the monochrome trend with bright pops of color is a doable look that will surely please the kiddos. Let them have a hand in the design using homemade artwork or by picking out their favorite colors. The brighter the better! Black and white is a simple color choice for a kid’s bedroom and the outcome is nothing short of stunning. Amp up the Scandinavian style by adding organic accents, such as pint‐size wooden furniture that will stand out against the contrasting colors. Form and function is a necessity when it comes to furniture, and the kid’s room is no different. Set up a livable space by storing toys and books in stylish bins and using seating furniture that will be both purposeful and stylish. Although you will see this trend predominantly in the more mature sections of the Scandinavian home, that doesn’t mean you have to shy away from it completely in the kid’s room. Bring the outdoors in by adding trees to the walls, faux plants in the corner or even a flower throw pillow that will give the room that sweet element of nature that is still kid‐friendly. Natural light is cherished in countries where it can be dark for the greater part of the year. When you combine light with white walls, it reflects to appear larger and brighter. This creates a clean aesthetic that is perfect for playtime or nurseries alike. If you’re looking for that final touch of authentic Scandinavian style for the kids, look no further than the artisans themselves. You can find innovative toys, posters and furniture through sites like Etsy or online boutiques that are uniquely Scandinavian. Authentic items are usually handmade, well‐constructed and entirely charming.